1. ( * ) are required fields. 2. Your "tab" key to go quickly between boxes. 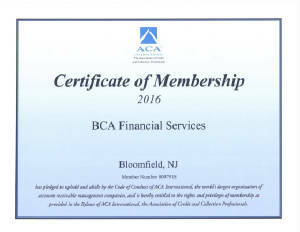 It is recommended that you read "The Functions of BCA Financial Services Collection Agency" below. BCA Financial Services reserves the right to reject any claim. Thank you. 1. Provide an itemized bill with the customer’s name and address. BCA Financial Services reserves the right to reject any claim. 1. A file is started on each account the same day it is received and debtor contact is begun at once either by mail, phone or both, in a legally proper manner, to effect payment as promptly as possible. This understanding of our mutual responsibilities commences the same day. 2. Payment by debtor, insurance(s), attorney, estates, trusts or real estate closings may be made to your office. So that neither you nor BCA incurs any liability, it is most important that you advise us promptly of payment to your office. Any unpaid client balances that we must process for collection will be assessed collection costs not to exceed fifty percent of balance. 3. You will know, by our month-end statement, of any payments received in our office. Repeated requests for status information will only deter us from our collection duties. circumstances may occasionally call for discretion in this regard. Fees are billed to you based on the settlement amount only. (Where settlement is by return of merchandise or credit, a half-rate will be billed). If the case is in suit, DO NOT attempt to negotiate or settle as you may compromise the attorney’s chances of recovering your court costs and other charges that your debtor may owe you. 5. An agency hopes to collect each account in about sixty to ninety days. There will be, however, many exceptions such as tracing a “skip” (moved, left no address) monitoring a part payment plan, legal action, etc. In the case of suit against your debtor, neither the agency nor the attorney have any control over the sometimes lengthy timetable of the courts. Bear in mind that a collection agency expends 100% of its overhead, labor and costs to collect an average of 25% of accounts submitted. There are many valid reasons why other accounts may not be collected or collectible. The more information you can provide the more you can enhance the success ratio. Information such as phone numbers and place of business are most helpful. REGARDING PAYMENTS MADE TO YOUR OFFICE: You may choose to deposit any full or part payment in your account and advise us promptly, or you may send it on to us for deposit in our trust account (in which case, should it bounce, we would absorb the bank service charge). Either way permits us to monitor and maintain discipline with your debtor. If you accept a PARTIAL PAYMENT from your debtor please call us and inform us of the arrangement that was made and any new information on debtor’s check or money order that may be helpful as we follow up for additional payments. The claims you sent in are acknowledged promptly so that you know we received the information accurately and that you have a record of the accounts turned over. Occasionally you will notice a difference in the amount turned over. If you do not normally add the legal rate of interest or a service charge, we will assume that we have your authority to add applicable interest , where practical and to employ or retain this “payment motivation” at our discretion. When interest appears on a debt statement or collection letter, it signals to the debtor that this debt is accumulating and that prompt payment is an economical advantage to him. We urge you to watch your “AGEING” column where it refers to “DAYS”...depending on your business, you may want to keep an eye on the 90-120-150 day accounts. DELAY ALWAYS WORKS TO THE ADVANTAGE OF THE DEBTOR. We normally do not accept “secondary placements” (accounts which were previously placed with an attorney or another agency) and then only at a 50% rate. Each such account, however, may be evaluated on a case by case basis. We look forward to a long, happy and mutually beneficial relationship. BCA Financial Services uses Experian Credit Bureau exclusively for their on-line reports and delinquent account listings. For their BUSINESS searches and listings BCA Financial Services is a member of Dun & Bradstreet business credit bureau. We will acknowledge the next business day.